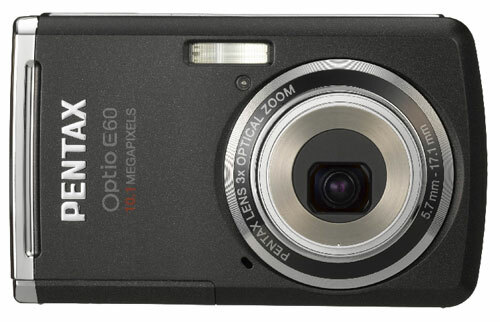 Pentax Launches Cheap Optio E60 | OhGizmo! Sensitivity for the camera is from ISO 100 to 6400 and can be fixed at specific settings or set to auto mode. Digital shake reduction is offered in both photo and video modes and the camera features Face Detection. Images are stored to 6.3MB of internal memory and SD/SDHC memory cards. On the back of the E60 is a 2.4-inch LCD and the camera has a shutter speed of 1/2000 – 1/4 of a second. Sure, the E60 isn’t as cool as the Samsung TL9 with its analog gauges, but the E60 is half the price.